Habit: Annual 8--45 cm. Stem: erect to decumbent, glabrous to hairy. Leaf: 1--22 cm; entire to lobed. Inflorescence: bracts generally ovate, entire, green. Flower: sepals 2--6 mm; petals 3--7(8) mm, ovate to occasionally obovate, yellow, base yellow to orange; stamens 2--7 mm; style 2--6 mm. Fruit: curved < 250°, 11--31 mm, 1.5--3 mm wide, obconic. 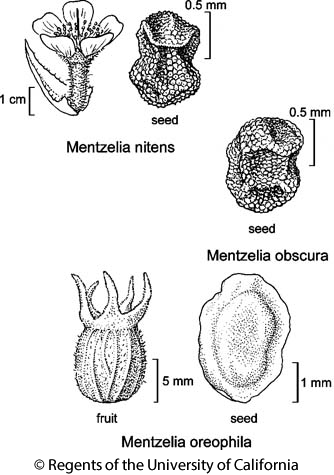 Seed: +- 1 mm, irregularly rounded above mid-fruit, ×-section occasionally triangular with grooves along longitudinal edges below mid-fruit, tan, not or sparsely dark-mottled; seed coat cells domed, < 1/2 tall as wide in age. Chromosomes: 2n=36. Ecology: Sandy to rocky washes, slopes, roadsides, creosote-bush scrub, blackbush scrub, Joshua-tree woodland; Elevation: 200--1616 m. Bioregional Distribution: D; Distribution Outside California: to Utah, Arizona, northern Mexico. Flowering Time: Feb--Mar Note: Intergrades with Mentzelia desertorum, Mentzelia albicaulis. Citation for this treatment: Joshua M. Brokaw, John J. Schenk & Barry Prigge 2012, Mentzelia obscura, in Jepson Flora Project (eds.) Jepson eFlora, http://ucjeps.berkeley.edu/eflora/eflora_display.php?tid=33269, accessed on April 24, 2019.